"Single File!" is licensed under a Creative Commons Attribution 3.0 Unported License. Permissions beyond the scope of this license may be available. Posted to Flickr on 19 April 2009. Part of the Stormtroopers series. 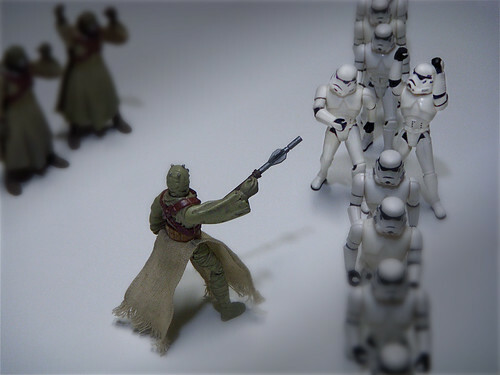 After failing to find the droids on Tatooine, the squad receives additional marching training from a civilian consulting firm. This photo was posted to Flickr on 19 April 2009. It was one of 500 images featured on Flickr Explore for that day. The last time I checked, it had 18,115 views on Flickr. "Single File!" by JD Hancock is licensed under a Creative Commons Attribution 3.0 Unported License. Permissions beyond the scope of this license may be available.